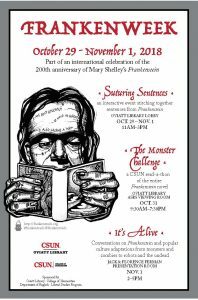 Frankenweek is coming up, celebrating all things “Frankenstein” and reminding us of the various ways that Shelley’s novel still speaks to us today about issues of responsibility and accountability in science, technology, and the creative arts. There will be reading, and there will be suturing! Come out and join in on the fun. Grad students enrolled in the ENGL 601 Scholarly Methods and Bibliography Class are holding a symposium on the theme “What Is A Topic” featuring many relevant panel presentations focusing on theoretical, cultural, and literary aspects of this foundational issue. Please feel free to drop by JR 304 on either Thursday, September 27th, or Thursday, October 4th, any time from 7:00 p.m. to 9:45 p.m to hear what it’s all about. Safety on campus is a shared responsibility. Now that the Fall 2018 semester is underway, please review the “Emergency Operations Desk Reference for Faculty,” posted at http://www.csun.edu/emergency/emergency-desk-reference. You may also reach the Desk Reference from the “Emergency Information” link at the bottom of the CSUN home page, http://www.csun.edu. Read it now to be prepared if and when something happens. CSUN’s Career Center will be hosting its largest career event of the semester on Tuesday, October 23, 2018, from 10:00 a.m. to 1:00 p.m., at the USU Northridge Center and Grand Salon, Northridge, CA. This event provides employers access to promote a wide range of employment opportunities and internships in business, industry and government and is an important opportunity for students, so please let them know about it. More information is available at https://csun-csm.symplicity.com/events/fall18. The Faculty Book Group is hosting a series of three Thursday meetings to discuss small Small Teaching: Everyday Lessons from the Science of Learning, by James M. Lang. Big changes are fine if you have the luxury of time. But if you’re interested in finding one thing today that could change your teaching tomorrow, then Small Teaching is for you.Come talk about this book with CSUN faculty colleagues. The meetings will take place from 11:00 a.m. to 12:15 p.m., in Santa Susana 108, on October 11, November 1, and November 29. For more information, see https://www.csun.edu/undergraduate-studies/academic-first-year-experiences/small-teaching-james-m-lang-book-group. The Waves Award Ceremony time and date has changed. The new time and date is Friday, October 19, from 3:00 p.m. to 5:00 p.m. in the Grand Salon. Please come out and help celebrate our students and their writing achievements! The Northridge Creative Writing Circle will be holding two weekly meetings this semester, one on Thursday, from 4:00 p.m. to 5:00 p.m., and the other on Monday, from 3:30 p.m. to 4:30 p.m, both in in JR 303. All are welcome, to one or both! The Northridge Review is open for submissions. Work may be submitted at https://thenorthridgereview.submittable.com/submit (And yes, for those of you who are curious, that is a Richter scale image from the actual Northridge earthquake. Aren’t you glad you missed it, if you did.) Also, please save the date for this semester’s NR launch celebration and reading, to be held on October 17, from 7:00 p.m. to 9:00 p.m., in CSUN’s Bianchi Planetarium. The event will include delicious refreshments and be preceded by an open-mic reading, beginning at 6:30 p.m. All are welcome and invited to participate. 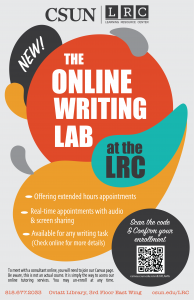 The LRC Writing Center is excited to announce the opening of the Online Writing Lab, featuring night and weekend remote, real-time tutoring for writing assignments in any discipline. The online part-time faculty consultants tutor using Zoom software (free download for CSUN students), allowing audio and screen sharing. Please let your students know of this exciting new development. Also from the LRC, the all new Conversation Swap, where international students and native English speakers can come together to provide a regular time and place for English learners to converse with native or near-native English speakers in a fun, low-stress environment. The program will also promote and encourage cultural awareness and understanding and give participants the opportunity to see the world from other perspectives while making new and rewarding friendships. If you are an instructor and would like to offer extra credit to your students for attending Conversation Swap, please let them know and they will be happy to work with you to confirm their attendance and participation. Conversations will take place on Mondays, from 12:00 p.m. to 1:00 p.m. in the LRC. This year’s faculty retreat is taking place at the zoo. There, we will highlight collaboration between various constituents across campus in our shared goals for student success and celebrate the opportunities that evolve from the diverse perspectives of CSUN faculty, staff, administrators, and students. The call for proposals this year is for a poster ONLY, relating to the theme, Thriving Under the CSUN Canopy: Celebrating Our Strengths. The deadline for poster submission is October 19 and the form is available at https://www.csun.edu/faculty-senate/faculty-retreat-proposals. The event will take place on Tuesday, January 15, 2019, from 8:30 a.m. to 6:00 p.m. and will feature wild animals as well as esteemed colleagues. Dorothy Clark published a letter titled “Dear Secretary DeVos” letter affirming the value and critical importance of public education in a new edited volume, Dear Secretary DeVos: What We Want You to Know About Education (Brill Publishers). Let’s hope the Secretary reads it. Irene Clark and Bettina Huber have published an article, titled “Argument Essays Written in the 1st and 3rd Years of College: Assessing Differences in Performance,” in the Journal of Writing Assessment (Volume 11.1). It can be accessed at http://journalofwritingassessment.org/article.php?article=124. Santash Khadka, along with co-editors Joanna Davis-McElligatt and Keith Dorwick, has published a new book, Narratives of Marginalized Identities in Higher Education Inside and Outside the Academy. The book features theorized narratives from academics who inhabit marginalized identity positions, including, among others, academics with non-normative genders, sexualities, and relationships; nontenured faculty; racial and ethnic minorities; scholars with HIV, depression and anxiety, and other disabilities; immigrants and international students; and poor and working-class faculty and students. The chapters in this volume explore the ways in which marginalized identities fundamentally shape and impact the academic experience; thus, the contributors in this collection demonstrate how academic outsiderism works both within the confines of their college or university systems, and a broader matrix of community, state, and international relations. With an emphasis on the inherent intersectionality of identity positions, this book addresses the broad matrix of ways academics navigate their particular locations as marginalized subjects. Just out from Routledge, the book is available in hardcover and ebook.